Yesterday was a photo shoot day. My sister Rain came along to photograph the horses under saddle; I love having pictures taken regularly under saddle, snapshots in time of their stage of training, to compare later on and see how we’re doing. First up is Arwen in walk. In this photo from nearly a year ago, she actually looks pretty good. She’s stepping under herself, her head is down and her nose just slightly ahead of the vertical. Although she doesn’t look soft, her neck isn’t squashed, she’s not resisting the bit and her poll is nearly the highest point. I also look okay; I’m relatively upright, my lower back looks soft and my hands are in the right spot. My leg needs to be longer, though, my toe is turned out and I’m looking down. This photo was taken yesterday. Arwen looks softer; while her nose is now on the vertical, her neck is still nice and long. Her poll can come up a bit but her head isn’t way too low, so I feel her head carriage is a bit better. Her hindquarters aren’t as engaged as in the photo above, though. While my back is slightly arched, my leg is a lot longer, toe more relaxed and elbows closer to my sides instead of stretching forward. My lower back isn’t sort enough, though, and my lower leg could come back a bit more. 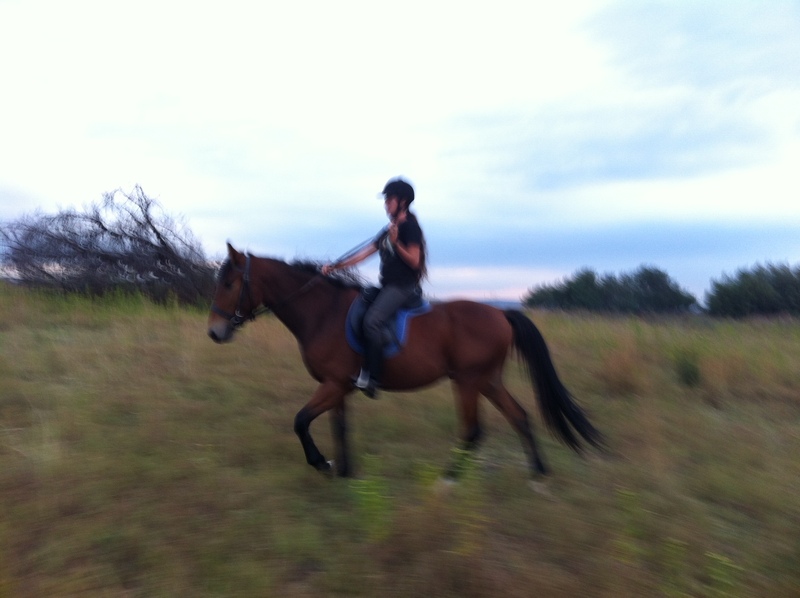 Here she is in (theoretically) a working trot, back in May. Yeah, we sucked. We really did. I like her long strides and how far underneath her back legs are coming, but that’s about it. Her nose is poked out and she’s resisting my hands, which are fixed to her withers. My shoulders are forward, my lower leg is much too far forward and even my saddle has slipped forward – always an issue with Arwen. While the angle of my knee is more open, I’m sitting in a chair. 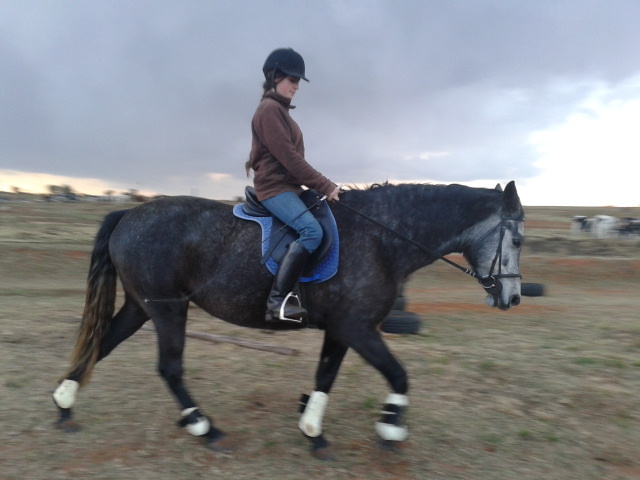 And this is probably my favourite photo of Arwen under saddle, ever. I love this pic. Her head carriage is almost perfect: her neck is still stretched along the top, but shortened into a good frame; her nose is almost on the vertical and she looks lovely and soft. The poll is closer to the highest point. She’s also engaging her hindlegs well and picking her feet up, although she seems ever so slightly on the forehand – her forelegs are taking a slightly larger step than her hindlegs. She looks a far cry from the rushing, resistant horse above. My seat also shows something of an improvement; while my lower leg still needs to come back a little, I look balanced and upright; my ear, shoulder, elbow and hip are all in line and my elbows and hands are soft. If we always looked like this, we would be awesome. Sadly, we don’t, but I still love this photo. And here we are in the canter. We had a massive fight about this on Thursday; she had two weeks off while I was away and she was injured, and when I got back on she decided to run, lean on my hands, and refuse to do a working canter at all. 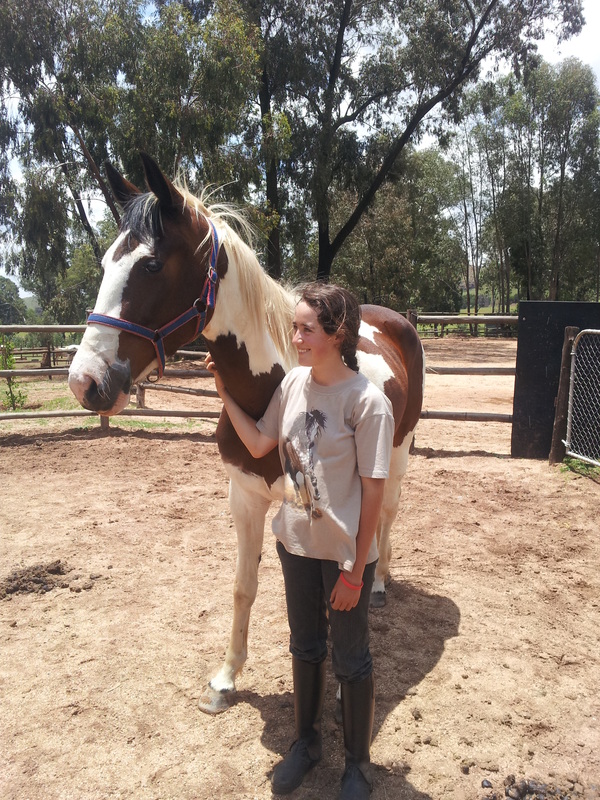 Yesterday she finally settled down and started to canter better, but still not quite where she should be. This is an older photo. Yeah, we sucked in a canter, too. It doesn’t help that she wobbled off course and up the bank in this shot. Again, I’m hunched forward, lower leg too far forward, hands fixed. She has her nose poked out and her ears laid back, showing that this canter probably feels just as awkward as it looks. This pic from yesterday shows some improvement, but unfortunately not much. She looks rather more in control and I’m sitting a little straighter and more comfortably, but she still has her head up and nose out. My lower leg is still a bit too far forward, but my elbows are in a slightly better position and I’m looking up. Her hindlegs seem nicely engaged but her incorrect frame shows that she’s still resisting the contact. And now for the jumping. This picture is only from about six months ago, back in August. I love how she’s picking up her knees in this photo over a 90cm upright, and she also seems to have taken off at a good spot. My hands, however, aren’t helping her. My elbows and shoulders are locked and my hands are resting on her neck for balance, not allowing her any freedom of her head and neck. In this photo from yesterday, my position shows some improvement. While I’m still too far out of the saddle and too far away from her neck, my hands are following her head and on top of her mane instead of nailed to her withers. Maybe for this reason, she’s jumping higher (and the jump is 1.10m) and has her feet closer to her chest instead of hanging from the knees as in the photo above. Lastly, Arwen in shoulder-in. I’d post half-pass, leg-yield and haunches-in photos as well, but I don’t have very good ones. This isn’t a good one either, but you can still see all the flaws: she looks uncomfortable, my inside shoulder has dropped way too low, and she’s turned too much to the inside – she’s doing shoulder-in on four tracks instead of two. Her head is also up with the nose poking out. Here, she looks more correct. Her relaxed head carriage and ears show that she’s happier and more comfortable. My inside shoulder is still dropped, and my inside elbow is turned out, but I’m a little straighter than in the previous photo. Most notably, the angle of her shoulder-in is now correct; her outside foreleg and inside hindleg are in line, so she is travelling along three tracks. 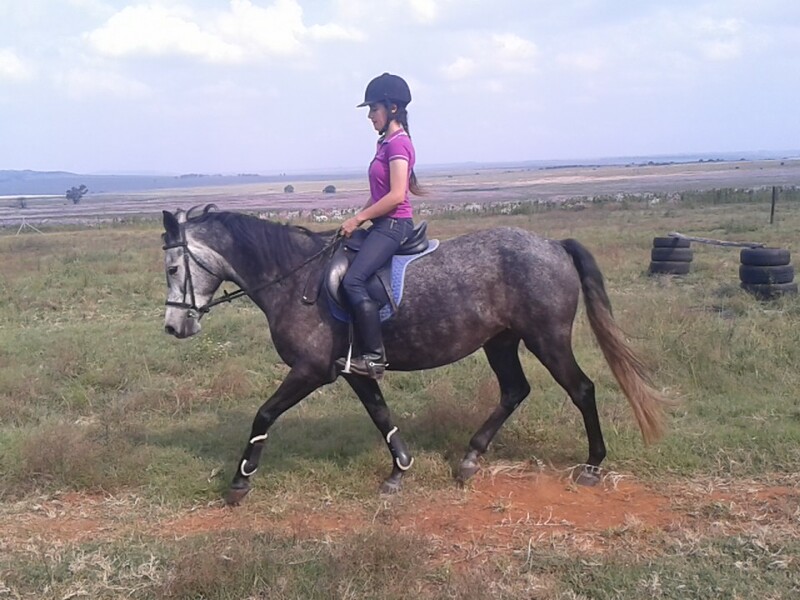 She also appears to be moving forward with better suppleness and impulsion than before. All-in-all, I’m not 100% happy with our progress; our canter in particular could have improved substantially over the past year. We’re definitely going in the right direction, though. Considering yesterday was kind of an off day for Arwen anyway, it’s not too bad. God willing the year ahead of us will be a year of more learning, improvement and progress. Although I’ve spent many hours with Thunder working in the confines of a lunging ring or arena, the ultimate goal has always been to turn him into a reliable hack/trail horse/whatever you want to call it. While the thrill of showjumping and the concentration of dressage have their appeal, I’m afraid my idea of a perfect ride is out in God’s amazing creation with a good horse between my knees and my Beloved by my side. Skye has always fulfilled my love for outrides, but I know that even the best horses don’t stay on Earth forever. Besides, my Beloved needs a ride too, so it was quite thoughtful of God to give me steady little Thunder three years ago. Five years ago, a scary fall off an unruly stallion gave me a nervousness for riding out that has still not quite dissipated. The arena is still my security blanket, with the comforting thought that should my horse take off there’s a limit to how far he can run, and safe footing to run on. 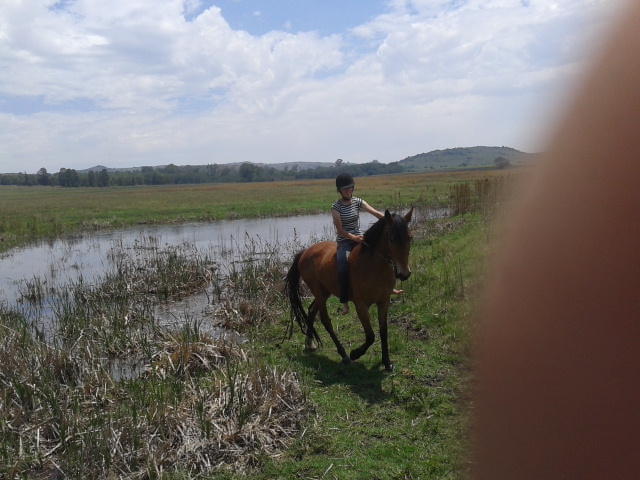 On outrides, though, a bolting horse can go over rocks and into holes as much as he likes, if you can’t stop him. 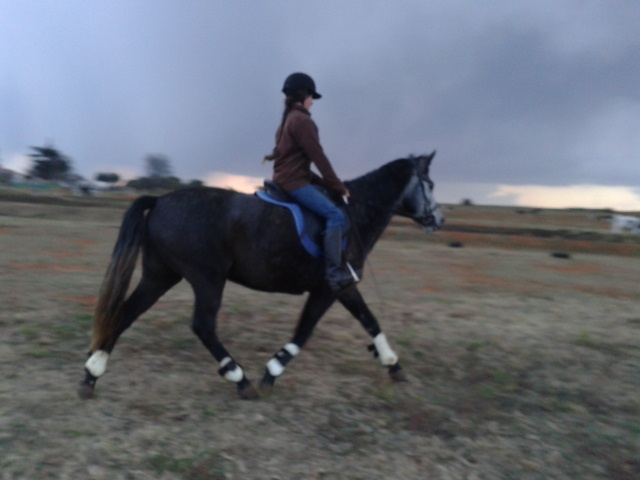 And with that nervousness I nearly gave up on the idea of schooling Thunder as hack altogether. But my God is with me and outrides with my Beloved are awesome, so when the latter came in on the scene, I started working on Thunder’s outrides with renewed vigour. We have been going out on and off for almost a year now (Thunder and me that is, my Beloved and me have been going out steadily), and while a long way from a relaxed hack, he’s starting to become an enjoyable ride. On Sunday my Beloved and I took Skye and Thunder for our first long outride since I had that fall off him in January. I know that the fall rattled him just as much as it rattled me; he’s scared going past that spot lately, and had been spooky and silly on outrides since. But the only way past his nervousness is through it, so we arranged our outride with me on Thunder and my Beloved on Skye. Once the two boys had had a serious man-to-man talk (“You will not buck or run away or spook or try to throw her off in any way, or scare her or hurt her, kapish?”), we set off through the glorious fields of six-foot-tall, pink-and-white daisies known as kosmos. It was a beautiful windless sunny day that makes you wish that summer wasn’t over, and everything smelt like kosmos and horses and leather, and we walked and talked and laughed and had a few long, awesome lopes and Thunder was a jewel. At first, every time we loped, he set off at a flat gallop for the first two steps, but with my Beloved keeping Skye well under control, he soon settled into a nice lope. 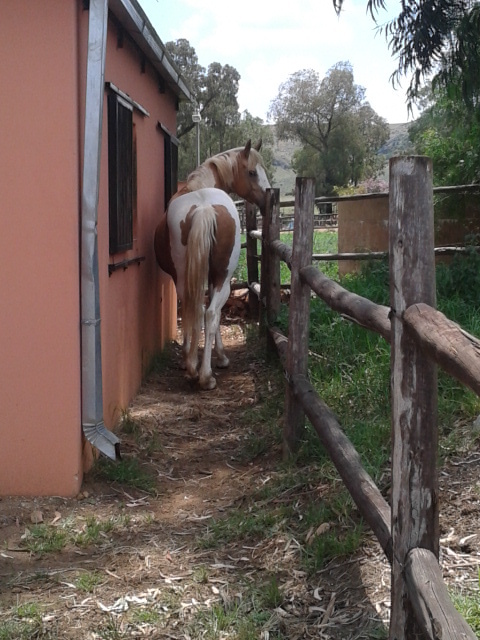 We rode through the farm next door and took an unfamiliar route, but although he was a bit looky and felt nervous a few times, Thunder didn’t shy or bolt. 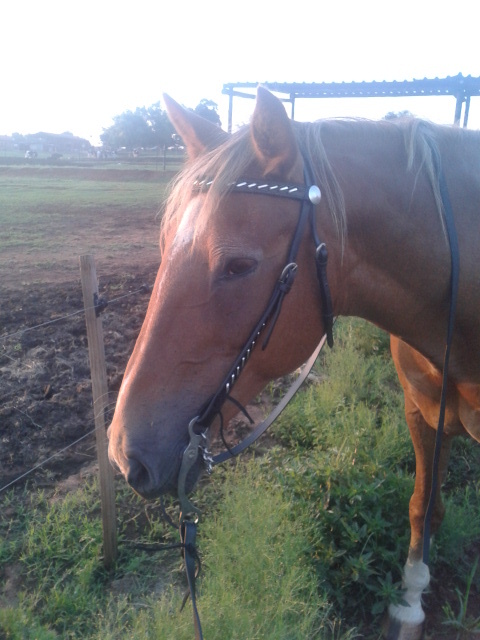 I kept my reins quite short, and both my hands on the reins most of the time, instead of riding him on the approved floppy Western rein. Although I know he should go on a long rein, he has bolted with me a few times like that; with contact on his mouth, I can stop him bolting before he even really gets started. Towards the end of the ride, I could take the contact away and ride with one hand because he was more relaxed; I know that riding him like this could slow down his progress on riding with a loose rein, but it’s a sacrifice I’m willing to make to prevent having any more scares on him with bolting. Then yesterday I took him for a solo outride, always more nerve-wracking because he doesn’t have the moral support of his mommy and I don’t have the moral support of my Beloved, but he was awesome. Again, I kept a contact on his mouth, but as it turned out, I barely needed it. He startled once, but didn’t spin or bolt. We even went through the forest for the first time. The forest, which is very dense and full of weird rustling noises, is always a spooky place for youngsters, but Thunder seemed calm and even happy. He walked briskly with his head up and ears pricked, interested in his surroundings and perhaps a little wary, but not frightened. It was wonderful. 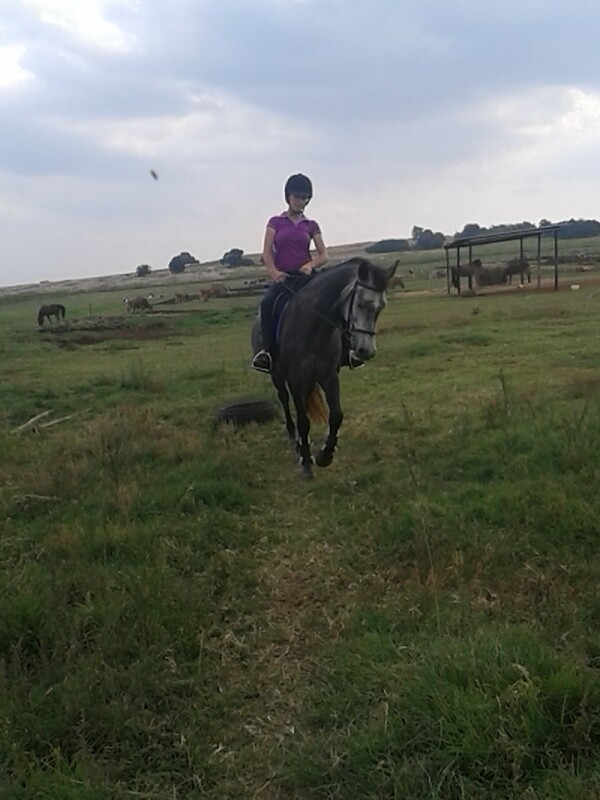 I love my baby horse. Yes, we have a long way to go, but he is only three years old, after all. 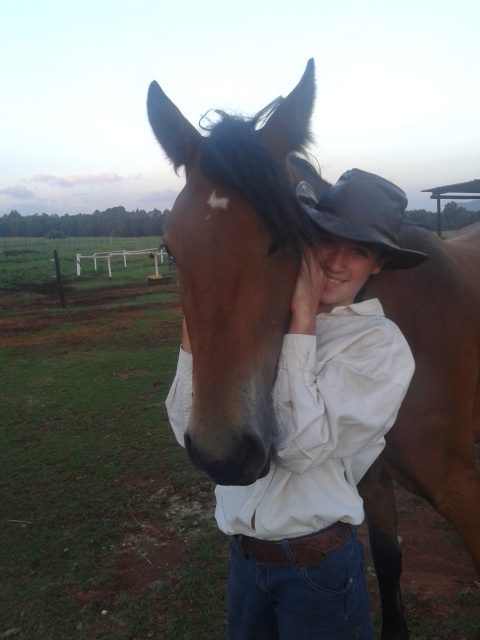 Thank You, Jesus for answering my prayers with this beautiful bay gelding with the heart of gold. It’s been a busy month. 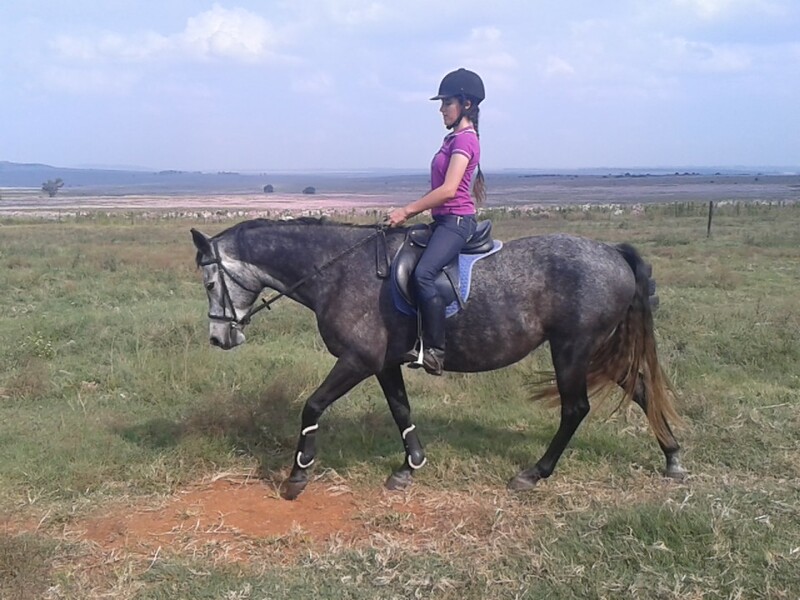 Between studies, horses, preparing for a big show with the cowies, writing the eQuest for Truth blog, novelling a bit and studying for my learner’s licence, blogging kinda fell by the wayside. 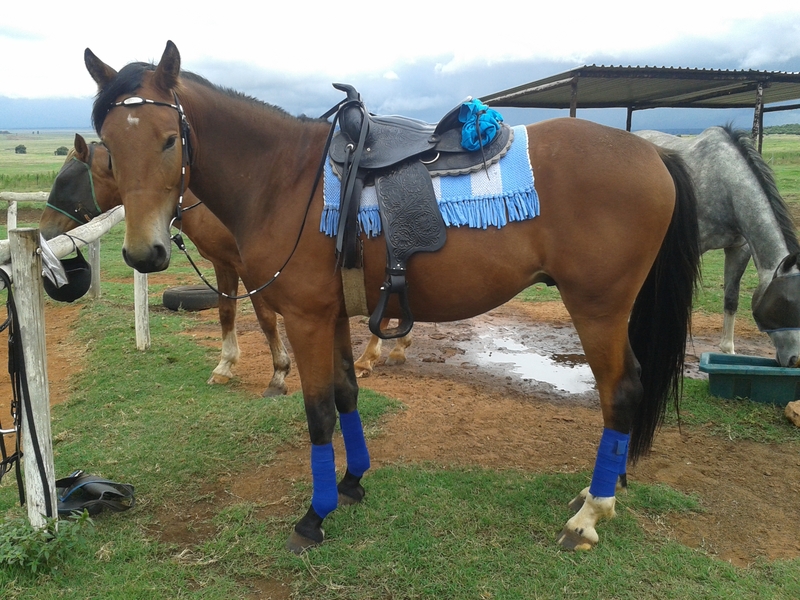 Skye has been doing some dressing up; I gave myself permission to be just a little bit tack-crazy for a while and blew some extra cash on a bunch of awesome Western stuff, including a beautiful silver lace bridle, Western curb bit and Navajo saddle blanket to match the saddle. She has been going extremely well in the curb. Its mouthpiece and port are identical to that of the pelham she was going in, but the shank is significantly longer and slightly curved; she feels a lot more sensitive to it, and I wouldn’t trust a lot of riders with it because I think it is a pretty harsh bit. I doubt I’d ride her English-style on a contact with it either, but as it is now, it’s perfect. She’s learned to neck-rein quite consistently so I actually don’t have to touch her mouth except to slow down, and even then it can literally be just a touch. So most of the time, the bit just sits there in her mouth and I can guide her with a gentle touch and no severity is involved, but if she gets overexcited and I need some good brakes I have the backup of the strong curb if I need it. Skye has just always gone a lot better in a curb of some sort and, when used with care, this bit seems to be the best one for her so far. Although for years I believed that changing a horse’s bit from a snaffle to something harsher should be absolutely the last resort and even then was something of a failure, I’m starting to rethink this. We all know, after all, that the bit is only as harsh as the hands that use it. After riding both Skye and Magic in snaffles for months and finding myself bullying them around with my hands because it was the only way to stay in control, I got tired of being frustrated and yanking on my horses’ jaws and put them both in curbs. Skye is in her Western curb now and Magic is in a pelham with the reins through the top ring, so it has something of a Kimberwick action. Both of them are significantly happier, and so am I. Magic now goes in a proper outline and I can ride him with an extremely light contact, using just faint pressure for aids. He still flips out every now and then and tosses his head in the air and threatens to rear, but he did that rather more in the snaffle. I also took him from a standing martingale to a running martingale, which has no effect up until he wants to break my nose, and is then quite invaluable. The other thing is that in the snaffle I used to hang onto his mouth for dear life whilst jumping, because otherwise I would have no control at all when he hit the ground. In the pelham I can give him as much rein as he needs, knowing that if he does take off when he lands I can get him back in a stride or two with no trouble. I certainly don’t think that all horses should end up in curbs, but I do believe that in the right hands a curb can be a lovely thing. All Grand Prix dressage horses go in double bridles after all, because a snaffle just doesn’t have the subtlety. 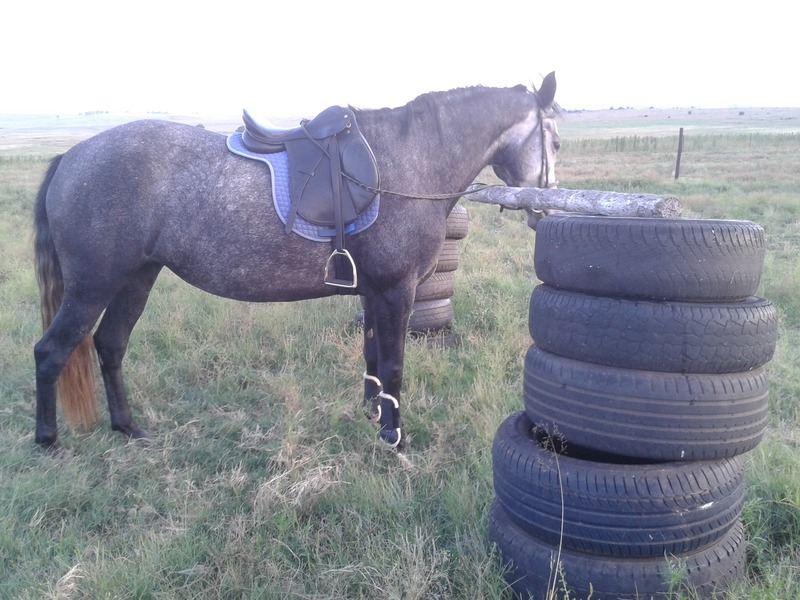 It should by no means be the quick fix for every horse – yanking on a curb is going to ruin a mouth much faster than yanking on a snaffle – but it can make riding a whole lot more pleasant for horse and rider both. Speaking of Magic, he is now sound again. The wound on his leg has healed nicely into just a little bit of a mark with a bump of scar tissue; it’s a bit unsightly, but doesn’t affect his soundness in any way. 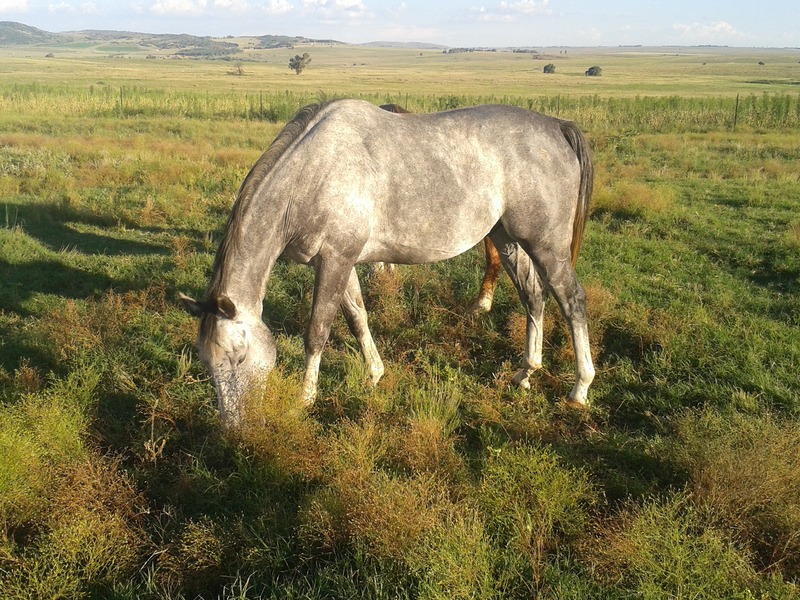 I brought him straight back into work and he is a lot more sane in the paddock and happier in his own skin. His flatwork is quite good at the moment; transitions can be messy and panicky, but on the whole he is much calmer and more obedient. Jumping has been either awesome or terrible. When I jumped him for the first time after his holiday he was stunning, didn’t overjump a thing, never stopped and went about his business calmly and happily. The next time, I overfaced both of us and he had a stop because I wasn’t there for him. With horses like Arwen and Reed, I can afford a stop because chances are the next time I’ll be annoyed with myself and ride intentionally, and they’ll go for me. Magic doesn’t. He’s a much more sensitive soul, and he decides that since he was allowed to stop once it’s okay to do it again until the next thing I know he’s refusing 60cm cross-rails. The trouble is that it makes me timid because when he does jump after a stop he overjumps, and when a young thoroughbred with a lot of talent overjumps, I mean clears-the-1.8m-uprights kind of overjumping. I haven’t come off yet, but it is a bit nerve-wrecking. I wouldn’t say that I’m afraid of Magic all of the time. 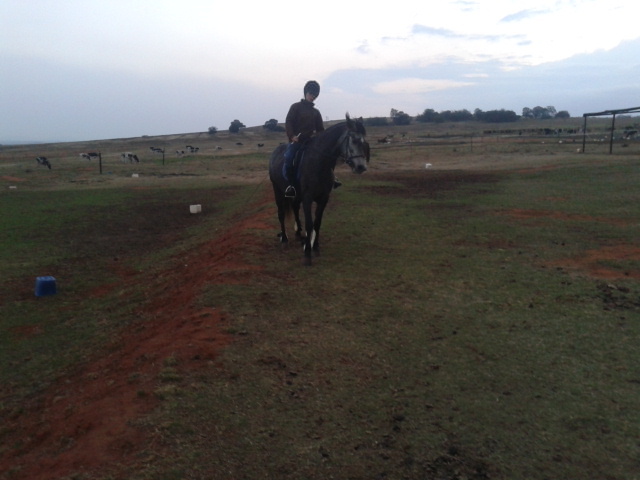 I certainly used to be; cantering him was a bone-meltingly scary experience for the first few months. Now, I’m totally fine with him 90% of the time, but when he starts pretending to be a giant pogo stick I lose my nerve. There’s an easy way around it, though, and that’s not to overface us before we’re ready and to build the heights slowly, because as long as I’m confident he’s confident and jumps sensibly. Arwen has been amazing. Our show was unfortunately cancelled, but I’m looking at another one later this month. 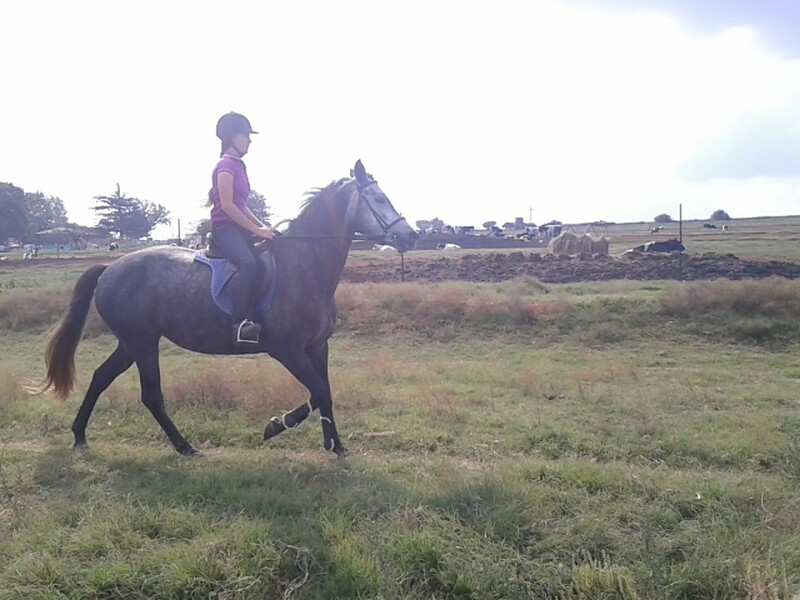 Her canter and canter transitions have improved significantly, but her canter can still tend to be on the messy side, either being an awkward half-trot half-canter or being rather too fast. Part of it is that the arena is on a slope and it’s very hard for her to balance whilst going downhill, but some of it is just training. She tends to be pretty heavy on my hands; easy enough to stop, but very hard to get into a decent outline. She works beautifully with her hindquarters and her hindlegs come right down underneath her, with a good round back, but the head and neck just aren’t there. 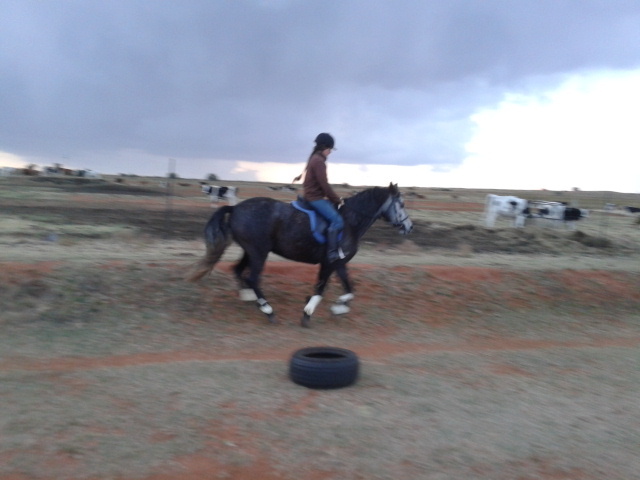 I’ve been schooling her in side reins to try and correct that. Lateral work in trot is coming along well with leg-yield, haunches-in and shoulder-in all there, just in need of some fine-tuning. I also asked for her first few steps of leg-yield in canter, and although it was awkward, she understood what I wanted and gave me three diagonal strides before losing her balance and fumbling along on a straight line. Flying changes are still a huge struggle, but she has suddenly decided that she always halts squarely. As in, always. When she’s led, when she’s lunged, when she’s ridden, probably even when she stops at a jump. Thankfully this seldom happens; the last time we jumped was fabulous. 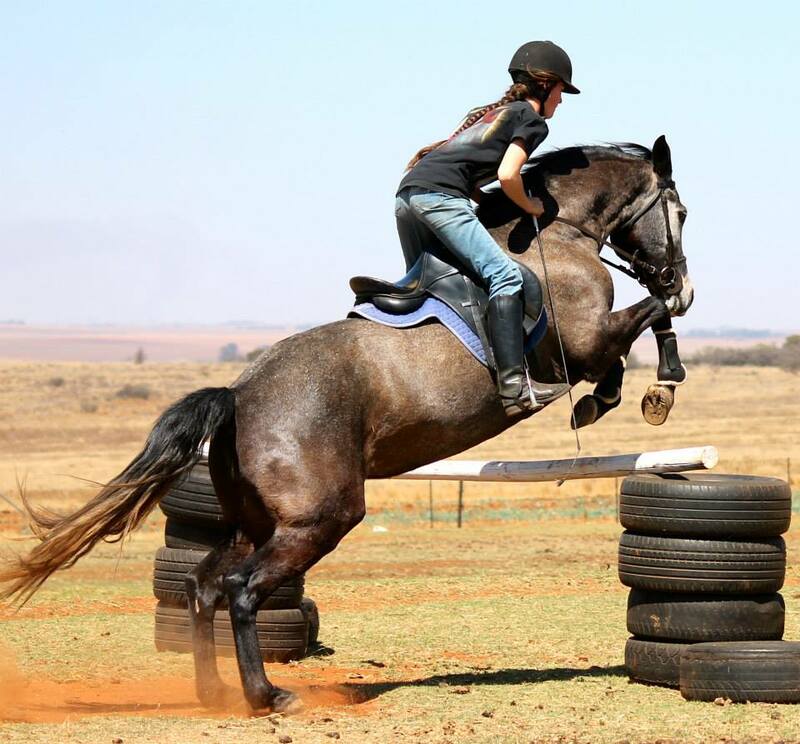 We were just popping over an upright in a circle, working on landing on the right lead, and once she’d worked hard at that I decided to have some fun and go up to 1.10m. She was utterly pro at that, of course, so I took a risk and put it up a little higher. She put up her ears and cleared that too, so I made it a bit higher and promised her that we were only going to try once, and the next thing I knew we had cleared about 1.30m. 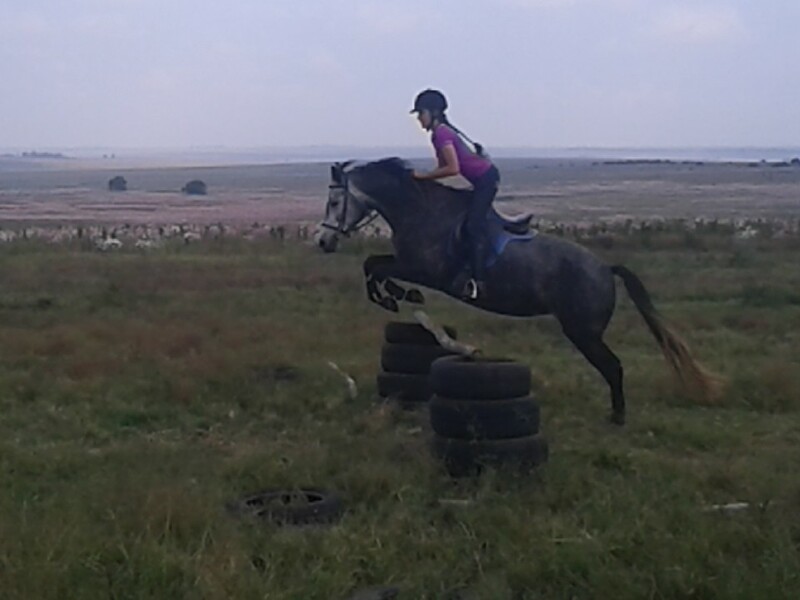 I doubt Arwie will ever be competitive at that height – it is rather ridiculous to ask that of a 14.2hh pony – but it was still plenty of fun. And considering the Mutterer once doubted we’d ever go higher than 1.00m, anything is possible. Reed has been amazing at dressage recently. I rode him in side reins a couple of times to fine-tune his outline, and he now goes like a real little spotty Lipizzaner, light as butter in my hands with his proud little stallion neck all arched. His canter is an absolute dream, slow, measured and rhythmical. I put on a pair of spurs and discussed some lateral work with him too, and he was fabulous; shoulder-in he knows, but he also gave me turn on the forehand, some leg-yield, and his first few steps of pirouette. His jumping was a bit up and down. At the start of the month I challenged him by putting up a 1.10m upright, which he bunny-hopped over and earned my great praise; but last week he had a really off day and stopped consistently at a 90cm double that he shouldn’t have batted an eyelid at. I made him jump it a few times before writing it off as a bad day. They happen. Baby Thunder has been dressing up as well, rocking the Western look. I wasn’t going to buy him a bridle, but then I saw this Poco bridle and it was cheap and I really liked the browband and that very afternoon he bolted on an outride and one of his reins broke right off, so I bought it. He has been hard to stop from a lope recently, setting his jaw against my hands a bit; in fact his whole lope needs work. Although he has been changing leads absolutely beautifully, he lopes too fast and falls out on circles. He is also jittery on outrides, especially where I fell off last time; the memory has probably made him nervous. We’ll work through it, though. He’s still a baby, after all. To wrap it up, look who’s back. CWT regulars will recognise this big, odd-eyed, German giraffe as Sookie Lynn von Samaii, an imported warmblood bred in the purple and born to do dressage. She had a bit of maternity leave but now we’re aiming for HOY next year and she needs to come back, get in shape and behave herself, and as she’s always been my project I’m really happy to be back on her. Watch this space. I’m still busy. Glory be to God for allowing me to be healthy and happy and working hard at what I love.